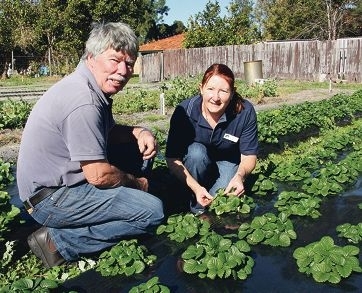 Strawberry specialist Gerry Verheyen, of Wanneroo, and DAFWA project leader Aileen Reid. Under the Department of Agriculture and Food program, Vietnamese strawberry growers ” who make up at least 80 per cent of the industry ” will get specialised advice on correct irrigation and fertiliser use. Project leader Aileen Reid said language barriers had made technical information hard to communicate with some of the growers. ‘We will be translating information into Vietnamese, using computer tablets in the field and providing short video clips on DVD to demonstrate good practices,’ she said. Ms Reid said more efficient irrigation was the key to improved returns for growers through better use of water and control of soil-borne diseases. The WA strawberry industry is located mainly in the Wanneroo, Carabooda and Bullsbrook areas.